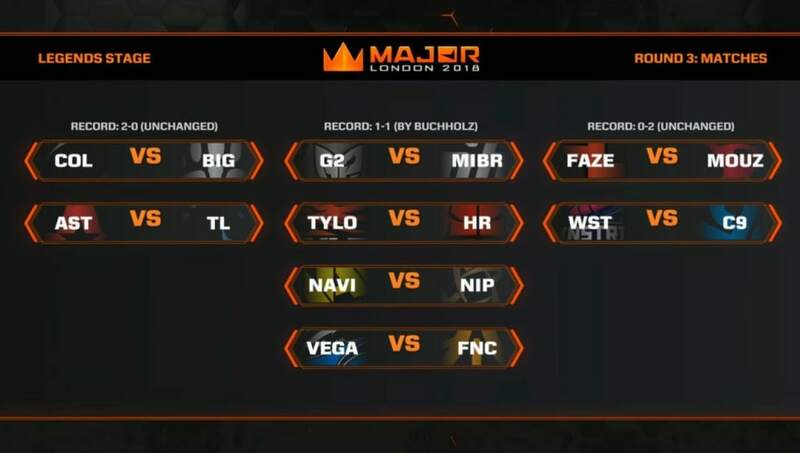 ​The FACEIT Major Legends stage Day 3 matchups were revealed by the organizers Thursday as Day 2 concluded. ​​A total of 16 ​Counter-Strike: Global Offensive teams continue the FACEIT Major ​Legends stage in Day 3. In matches of 2-0 teams, compLexity Gaming will play against BIG, and Astralis plays Team Liquid. G2 Esports will play MIBR, TyLoo will play Hell Raisers, Natus Vincere will play Ninjas in Pyjamas, and Vega Squadron will compete against Fnatic. Those eight teams have a 1-1 record in the competition so far. The final four teams have a 0-2 record at the FACEIT Major. FaZe Clan will play mousesports, and Winstrike Team will play Cloud9, with the losers of each being eliminated.